Did you know that there is a day in September for penicillin allergies? Yes, Sept 28th, 2018 has been chosen as this special day because the reports of allergies to penicillin have been dramatically increasing! 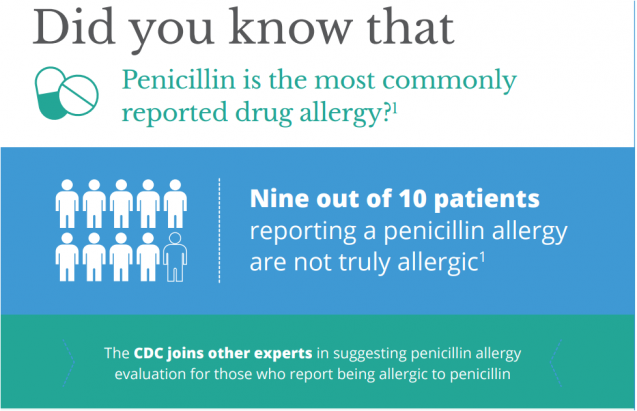 Did you know millions of Americans have been MISDIAGNOSED with a penicillin allergy? While 10% of the population believes they have one, LESS THAN 1% ACTUALLY HAS ONE!! Penicillin may have been around since 1929, but it remains the go-to for many illnesses, from strep throat to meningitis. In some cases it is the only known, effective treatment out there. Of course, if you have a penicillin allergy it’s vital to identify it so you can pass that information on to health providers. But if you don’t, you’re spending extra money for alternative drugs which are less effective. In some cases you’ll needlessly miss out on having access to any treatments at all. What’s the problem with alternative drugs? Some of alternatives may open you up to additional health problems. Many of them are broad-spectrum antibiotics. You may be aware there are both good bacteria and bad bacteria in our bodies. The broad-spectrum antibiotics kill both. This can open the door to other infections. Penicillin is an antibiotic as well, but it doesn’t have this problem. Thus, if no allergy is present it’s usually a better choice. It’s important to note people can also end up allergic to this drug after years of taking it safely. An allergy is nothing more than the body’s decision to start producing antibodies in response to certain substances (Asthma & Allergy Foundation of America) . Some have allergies and don’t know it, while others think they have allergies, and do not! How can this allergy be treated? Avoidance is the first step. If you really are allergic you need to let all your medical providers know so they can set you up with alternatives. We may also prescribe antihistamines or corticosteroids, depending on your unique needs. How can anyone think they have an allergy if they actually don’t? There are three ways this happens. Sometimes people show symptoms while they’re taking penicillin, but they’re coincidental. You might have had an allergic reaction to something else which was blamed on the penicillin. Your doctor may have had a “better safe than sorry” philosophy. In earlier decades the risks of the alternatives hadn’t been as extensively studied, so physicians usually felt there was no harm in switching over. Sometimes the apparent allergy was the result of a drug interaction you may have had at the time. Finally, you might well have had an allergy as a child, but that doesn’t mean you still have one. The allergy often reverses itself, especially if you’ve avoided penicillin for 10 years or more. It would be wise to get testing from a certified allergy testing clinic like ours just to be sure, so you can use this life-saving drug if you need it. We will perform a scratch skin test, a blood test, or both (yes, we can even test children for allergies!). In most cases this will give us an accurate read on whether the allergy is present. In some cases we may perform a “supervised consumption” test, in which we have you take a little penicillin here at the office to see what it does. We will only do this if we judge the risks of doing so to be low. Testing doesn’t take much time, and it doesn’t cost much! So don’t guess, don’t self-diagnose, and don’t rely on what doctors told you when you were 8. Please, make an appointment with your allergy specialist to get tested today! Resources to Read Penicillin Allergies? Salkind, Alan R., Paul G. Cuddy, and John W. Foxworth. “Is This Patient Allergic To Penicillin? : An Evidence-Based Analysis of the Likelihood of Penicillin Allergy.” JAMA 285.19 (2001): 2498-2505. Blumenthal, Kimberly G., et al. “Addressing Inpatient Beta-Lactam Allergies: A Multihospital Implementation.” The Journal of Allergy and Clinical Immunology: In Practice 5.3 (2017): 616-625.